There has been some recent commentary from a number of market participants suggesting that the US tech sector is “crowded” and “expensive”. In reality, the valuation of Alphabet compares very favourably to the Australian tech sector and the broader market. The consensus estimate for Alphabet’s CY18 earnings is just over $40, the stock trades at $988 per share, which puts it on a headline PE multiple of 24.6x. This doesn’t factor in Alphabet’s huge net cash position, which stood at $91bn as at June 2017. The company is earning interest income of just ~$1.2bn annualised on this cash pile. 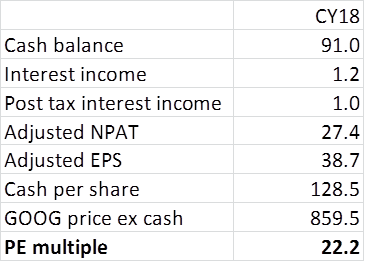 If we deduct the cash from the market cap and back out the interest income from the earnings we get a cash PE of 22.2x. There is one final (more contentious) adjustment an investor could make to Alphabet’s earnings which paints an even more favourable relative value picture. Alphabet is currently spending ~$3.6bn on “other bets”, which is a combination of multiple early stage businesses. If we value this segment at zero and adjust for tax the multiple falls to 20.1x. 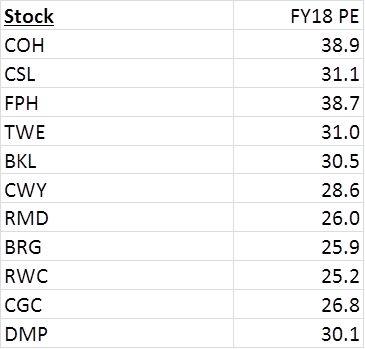 So, how does this valuation stack up against Australian listed tech stocks? Whichever way you cut it, very favourably. Most of the businesses below trade at a premium to Alphabet, but with lower quality and growth in our view. It seems to us that growth hungry Australian equities managers have crowded into the ASX listed tech proxies. 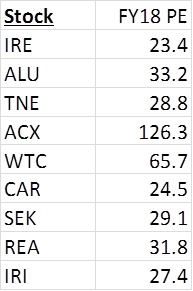 Which of these ASX listed businesses deserve to trade at a premium to the core Alphabet business? In our view the case for continuing to hold Alphabet is strong, particularly on a relative value basis in comparison to Australian listed growth stocks. For this reason Alphabet remains our second largest position at Totus. The ability to invest offshore and access higher quality businesses at lower multiples is extremely important for prospective investor returns.